Elizabeth, NJ - April 20, 2017 - Metrofuser, a leading global innovator, re-manufacturer and marketer of printer solutions announced a materials advancement called Thermo/Seal. Today's business class laser printers commonly operate between 40 to 60 pages per minute with duty cycles up to 250,000 pages per month. Between the heat, friction and pressure these devices and their fusers are pushed to their limits. To many are failing prematurely. Metrofuser has worked with a numerous manufactures in the development of Thermo/Seal. The introduction promises to reduce the occurrences of 50.x errors, the most common failure found on fusers. Reducing these errors will mean fewer warranties and service company call backs. "Despite being six times more expensive than traditional silicon products, we are leveraging Thermo/Seal as an investment." said Will DeMuth Chief Operating Officer. "Thermo/Seal is a proprietary product and will be utilized across all Metrofuser fusing products however it will not be available for resale." 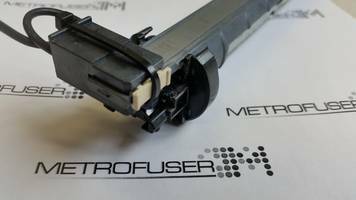 Metrofuser is a leading global innovator, manufacturer and marketer of printer parts, equipment, diagnostics, repair information and systems solutions for professional users performing critical tasks. Products and services include remanufactured laser printer parts, remanufactured printers and service training for HP, Lexmark and Canon brands. The company's customers include office equipment dealerships, online retailers, repair centers and MPS service providers nationwide. Metrofuser has been named to Inc. Magazine’s fastest growing companies five consecutive years.